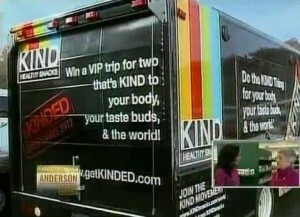 Makeup Mogul and KINDAHOLIC Bobbi Brown gave KIND cubes a make over for KIND’s first ever Snack and Give Back campaign. Her EAT PRETTY POWERFUL cubes empower women to embrace and enhance their unique beauty, not only through the makeup they wear, but also the ways they choose to live, eat and give back.“There’s a lot more to beauty than what we apply to our face. Like KIND, I believe that it’s about how you treat your body and what you put in it. When you eat healthy, it shows: your skin looks clearer, your eyes look brighter and you have more energy. It’s as simple as that,” explained Bobbi. In her cube, Bobbi included her four favorite delicious and healthy flavors, Dark Chocolate Nuts & Sea Salt, Cashew & Ginger Spice, Dark Chocolate Cinnamon Pecan, and Madagascar Vanilla Almond. A portion of sales of the cube will help KIND fund a new KIND Kitchen at the Broome Street Academy, an organization that Bobbi personally supports. Broome Street Academy is a public charter high school that prepares New York City’s most vulnerable young people to graduate with Regents diplomas. The Daily Beast reports that former Israeli Prime Minister Ehud Olmert stands behind the Palestinian delegation’s U.N. bid for statehood today. Olmert wrote, “I believe that the Palestinian request from the United Nations is congruent with the basic concept of the two-state solution. Therefore, I see no reason to oppose it.” Read the full story after the jump. 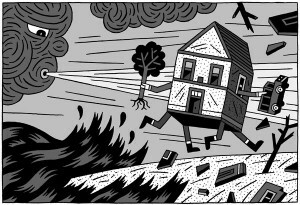 As climate changes continue to bring tempestuous weather along the Eastern seaboard, Orrin Pilkey suggests the we begin to retreat from the shores rather than rebuild beachfront properties destined to be devastated again soon. On Anderson Live‘s Thanksgiving episode, KIND surprised the Capital Area Food Bank in Washington D.C. with a donation of thousands of KIND bars and packages of KIND Healthy Grains as well as a check for ten-thousand dollars to help put food on the table this Thanksgiving for less fortunate local residents. You can visit FeedingAmerica.org to find out how to help the hungry in your community. “Of all the points of disagreement between Israel and Hamas, maybe the most profound is this one: Israel cares more about sparing innocent lives – including those of Palestinians – than does Hamas. Hamas has instigated yet another war where the chief loser will certainly be its own people,” observes Richard Cohen. His opinion piece in the Washington Post illustrates Hamas’s violent and destructive role in the Middle East conflict that is oft misrepresented on the world stage. We tend to feel our generation invented so much, but the truth is most of what we do has been done before. I was wondering this morning at Holidays as a community exercise: why does society organize itself so everyone has the same break at the same time? Why not celebrate rugged individualism and permit each person to take a break when they need it, rather than all at once? Is it part of how modern society is organized with work at the center of our lives, and the need to create moments where we all take a collective rest? But I then realized Judaism institutionalized religious holidays thousands of years ago, and I assume ever since society started to coalesce with any communal beat, with kids being taught at the same time, they figured out the benefits of this coordinated rites. Then today I was reading this article by Walter Isaacson about Benjamin Franklin, and it reaffirmed that the more things change, the more they are the same. Or at a minimum, that much less than we imagine has been totally freshly invented. I tend to think of mentors and friends like Ben Cohen of Ben & Jerry’s and Howard Schultz of Starbucks as the fathers of social entrepreneurship. And certainly in our generation, and with work from groups like the Skoll Foundation, SVN, Business for Social Responsibility, Net Impact, and just overall historical trends and social imperatives, social entrepreneurship has gone from a neat exception into an increasing and irreversible trendline. These Rotarian instincts were nurtured in a civic-improvement club that Franklin founded as a young printer in Philadelphia. The Leather Apron Club was composed of enterprising tradesmen, artisans and shopkeepers, what he proudly called “we the middling people.” Instead of replicating the rigid hereditary class system of England, America should have as its backbone, Franklin believed, a middle class whose success came from hard work. The Leather Apron Club discussed civic and political issues, devised schemes for self-improvement and formed a network dedicated to “doing well by doing good.” Its members helped launch a flotilla of civic associations, including militia and street-sweeping corps, volunteer firefighters, tax-supported neighborhood constables, health and life insurance groups, a library, a hospital, an academy for educating youth, a society for sharing scientific information and a postal system to help connect everyone. Franklin also understood the beauty of diversity. During his lifetime, he donated to the building fund of every church constructed in Philadelphia. When a hall was being built to accommodate visiting preachers, Franklin urged his fellow citizens to donate “so that even if the Mufti of Constantinople were to send a missionary to preach Mohammedanism to us, he would find a pulpit at his service.” On his deathbed, he made one of the largest donations for the first synagogue built in Philadelphia. In his will, Franklin left the bulk of his wealth to create revolving loan funds so that aspiring young tradesmen and shopkeepers could borrow a little money to get started, then pay it back so that subsequent young entrepreneurs could get a helping hand. These loan funds worked for more than two centuries. There is a lot of innovation today on mechanisms to fund social enterprises and to do so in a socially enterprising way. Several years ago, friends and I thought we had been so clever to come up with a model that is similar to what Franklin came up with more than two centuries before! Looking back may help us find answers to look forward to. So many in the Israeli and American Jewish community say that Palestinians take no steps to build trust or recognize that they are committed to live in peace with Israel. But Palestinian President Mahmoud Abbas has for over a decade consistently been courageous about the need for reaching a two state solution through non-violent means, to the point that other Palestinians often criticize him for his conciliatory tone and policies that have not been reciprocated by the present Israeli government. Netanyahu, Lieberman, and, perhaps worst of all Vice Prime Minister Moshe Ya’alon, keep marginalizing Abbas and giving him no room to operate. And yet the Israeli Administration has continued to unwittingly (or some fear, intentionally, so as to discredit the existence of moderate Palestinian partners to negotiate with) strengthen Hamas’s credibility – most recently with the Gaza war that ended with Israeli concessions that Hamas is trumpeting as a victory over the Zionists. Sadly over the last couple months the Israeli government has turned Hamas into an extremely popular party not just in Gaza but even in the West Bank, even among Christian parties. OneVoice Palestine staff in Gaza and the West Bank report to me that people see the Hamas way as the only way Israelis listen, and they credit Hamas with numerous (often imagined) victories, while seeing Abbas as increasingly ineffective and irrelevant because the Israeli government ignores his overtures. It wasn’t like this just a few weeks ago! The present Israeli Administration continues to try to weaken Palestinian moderates and destroy any legitimacy or credibility they may have left. Last week, Ya’alon said, “What stands out from this event is the irrelevance of Abbas. He’s only relevant for declarations and for unilateral steps to seek recognition at the UN.” So what does Ya’alon want? For Abbas to use force so that he will listen?! Didn’t we ask for Palestinians to use diplomatic means? Which is it? Do we want the Palestinian leadership to use reason as Abbas does, or force as Hamas does? And yet, Netanyahu’s response that same day was to announce more settlement building. It is fascinatingly depressing to see how extremists help one another become more popular. It is almost as if there is an unholy alliance between the Israeli and Palestinian absolutists, reinforcing each others’ visions and destroying the moderate camps on both sides. How long will the voices of moderation stay silent and watch their lives be hijacked? As the Palestinian Delegation gears up to make their case for Palestinian statehood at the United Nations, Yonatan Touval makes an interesting proposal in his New York Times piece to work towards a Security Counsel Resolution rather than General Assembly recognition. Ambassador Dennis Ross examines the conflict in Gaza from all sides, pinpointing the pivotal position that Egypt plays in fueling or ending the current violence in the region. See Ambassador Ross’s full Daily News opinion piece after the jump.